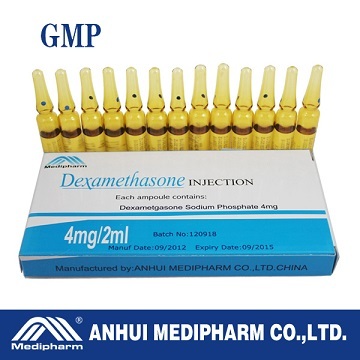 PHARMACOLOGICAL ACTION: Dexamethasone phosphate acts by controlling the rate of protein synthesis: It forms a steroid-receptor complex with receptor proteins, moves into the nucleus where it binds the chromatin and thus directs the genetic apparatus to transcribe RNA. It has a biological half-life in plasma of about 190 minutes and has relatively very weak sodium retaining properties. INDICATIONS: Conditions: where the anti inflammatory and immunosuppressive effects of a corticosteroid are desirable, including intensive treatment during shorter periods. CONTRA-INDICATIONS: Sensitive to corticosteroids, Tuberculosis, Ocular herpes simplex, Primary glaucoma. Acute psychosis and psychoneurosis, Systemic infection, Peptic ulcer, Osteoporosis. STORAGE: Store below 25℃. Protect from light. Keep out of reach of children.